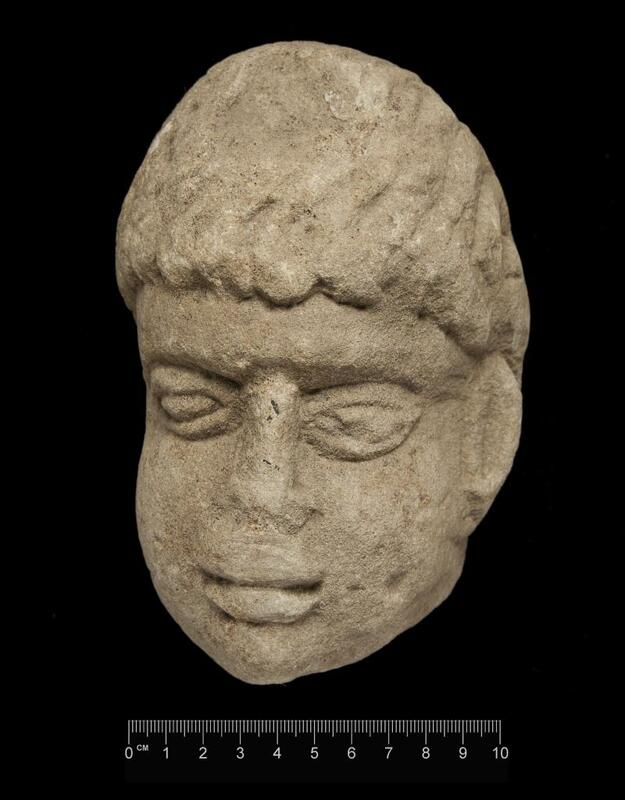 An 1,800-year-old carved stone head of what is believed to be a Roman god has been unearthed in an ancient rubbish dump. Archaeologists made the discovery at Binchester Roman Fort, near Bishop Auckland in County Durham, England. First year Durham University archaeology student Alex Kirton found the artefact, which measures about 20cm by 10cm, in buried late Roman rubbish within what was probably a bath house. The sandstone head, which dates from the 2nd or 3rd century AD, has been likened to the Celtic deity Antenociticus, thought to have been worshipped as a source of inspiration and intercession in military affairs. "It is probably the head of a Roman god – we can't be sure of his name, but it does have similarities to the head of Antenociticus found at Benwell in the 19th century. "We may never know the true identity of this new head, but we are continuing to explore the building from which it came to help us improve our understanding of late Roman life at Binchester and the Roman Empire's northern frontier in Northern England. "It's also an excellent insight into the life and beliefs of the civilians living close to the Roman fort. The style is a combination of classical Roman art and more regional Romano-British traditions. It shows the population of the settlement taking classical artistic traditions and making them their own." "The head is a welcome addition to the collection of sculpture and inscriptions from Binchester. Previous religious dedications from the site feature deities from the classical pantheon of gods and goddesses such as the supreme god Jupiter and those associated with healing and good health such as Aesculapius, Salus and Hygeia. "This one however appears to represent a local Romano-Celtic god of the type frequently found in the frontier regions of the Empire and probably representing the conflation of a classical deity with its local equivalent. The similarity with the head of Antenociticus is notable, but this could be a deity local to Binchester." The Binchester head is African in appearance, but Dr Petts, who is also Associate Director of Durham University's Institute of Medieval and Early Modern Studies, said experts were unsure whether these features were deliberate or coincidental. He explained: "This is something we need to consider deeply. If it is an image of an African, it could be extremely important, although this identification is not certain." Dr Mason added: "The African style comparison may be misleading as the form is typical of that produced by local craftsmen in the frontier region." The find was made as part of a five year project at Binchester Roman Fort which is shedding new light on the twilight years of the Roman Empire. The Binchester dig is a joint project between Durham University's Department of Archaeology, site owner Durham County Council, Stanford University's Archaeology Centre and the Architectural and Archaeological Society of Durham and Northumberland. Each summer, undergraduate archaeology students from Durham and the United States are joined by volunteer members of the public to painstakingly reveal more fascinating details from Binchester's past.